We have some exciting news for those of you who are used to work with IDEs and use the autocomplete feature. 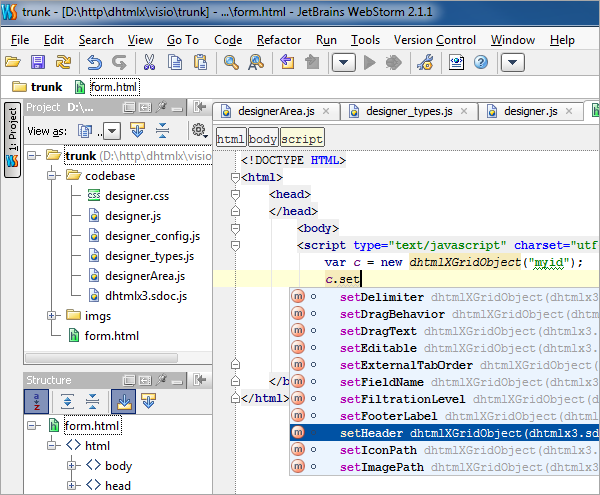 You now can enjoy autocomplete hints in your favorite IDE while you integrate the DHTMLX components into your web app. We provide the autocompletion plugins for Microsoft Visual Studio, PHPStorm, WebStorm, NetBeans, Aptana Studio, Eclipse, and others. This is strange, because everything works fine on our side. Please check that your followed the instructions carefully. is there likely to be an eclipse plugin in the future? Yes, we’ll add autocomplete feature for Eclipse in the near future. is there any newsletter that i can check to know if the plug-in has been released? 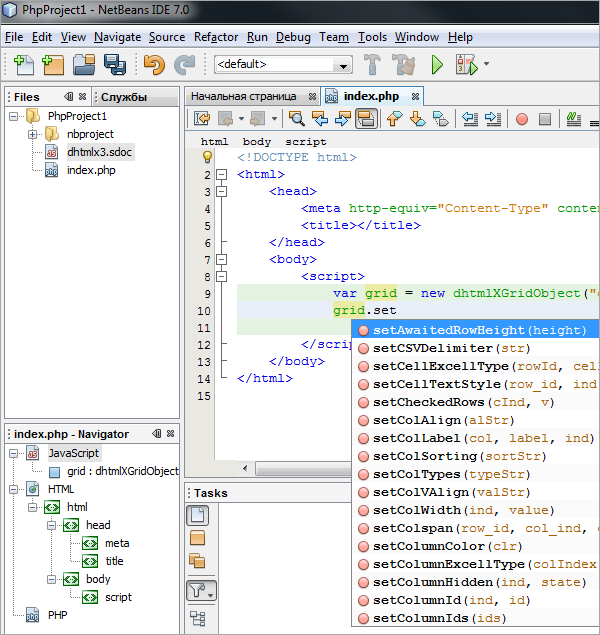 We’ve added the instructions on how to configure autocomplete for Eclipse. The required files can be downloaded here. Do u have autocompliation for eclipse? Richard, we’ve updated the post with the instructions for Eclipse. Good Job….but….An autocompliation for Komodo? 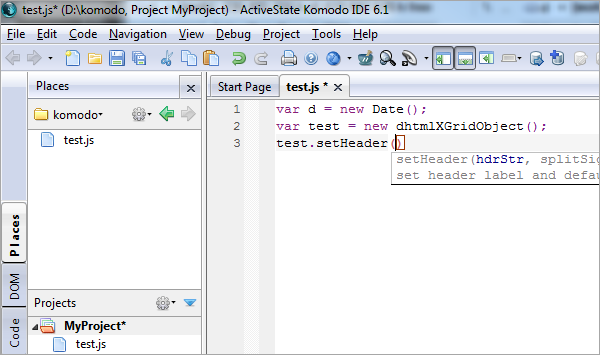 Added the instructions for Komodo in the end of the article. The download file is the same. Thank you very much!!! Fantastic! Please help out to resolve the issue. You have some old plugins, in the latest version everything works fine. This is great. 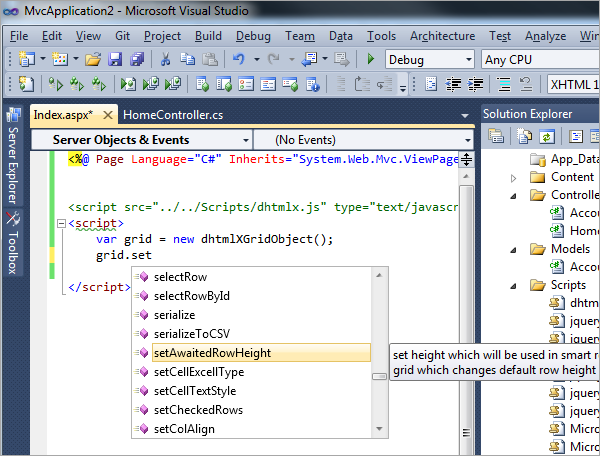 Also, for Visual Studio you can make this work in .js files as well as in html and aspx files. Just open the js file and drag dhtmlx.debug.js from Solution Explorer to the top of the .js file you’re working in. VS will create a comment with a path to the debug file which will cause Intellisense to work. Dreamweaver support would be great! We’ve added the instructions for Dreamweaver in the end of the article. Is there a way in visual studio 2010 to get the autocomplete available when you are in a js file? Or does it only work when you are in an a html page with the script tag above? I wold like to tell that the feature to add support for eclipse is not very good, because of problems with memory and GC. 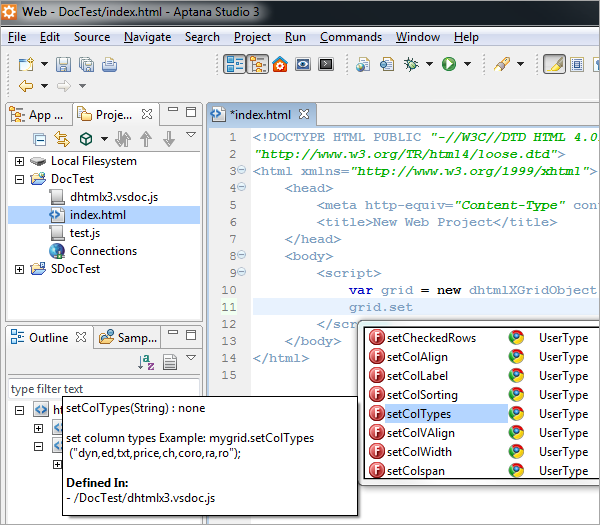 I had tested here with indigo and compared with visual studio, eclipse is muth worse. IS there any other possibility to have this kind of featured in another way in eclpse? I wonder that the problems that I had its envolved with the architecture of eclipse that is not very good for this this kind of feature. Any suggestions? Unfortunately, we can’t help you with this issue. We just provide the information for autocomplete, but how it works depends on IDE. I understand, but my real question is: Is any other way to have code completition in eclipse? Because this way is worthless because we have a lot o problems with memory and garbage collection using this. 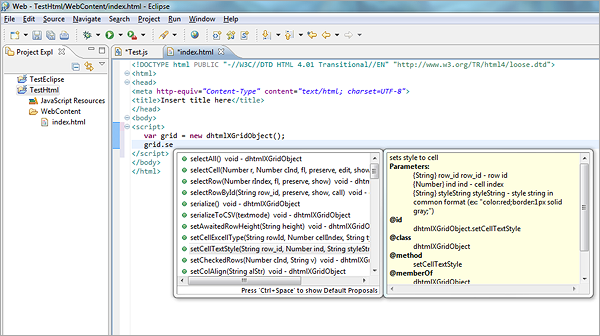 I heard that maybe DHTMLX would have a eclipse plugin more robust then this feature. Is that true? Is it possible to get the autocomplete functionality for Microsoft Expression Web 4? Please add support for JDeveloper 11g. I’ve already autocompletion in netbeans 7.0.1 who scan .js to build is autocompletion for project. I’m going to testing with .sdoc. sdoc format is exactly the same thing – standard comments for functions definition. You have copied not the zip file, but dhtmlx3.xml from it, right? Hi Ivan, sorry I’ve just read your answer. Yes I just copied the dhtmlx3.xml file and “dhtmlx” option appears checked in the list of code hints. However, when I start typing dhtml… no hint will appear. :-( Did I miss something ? 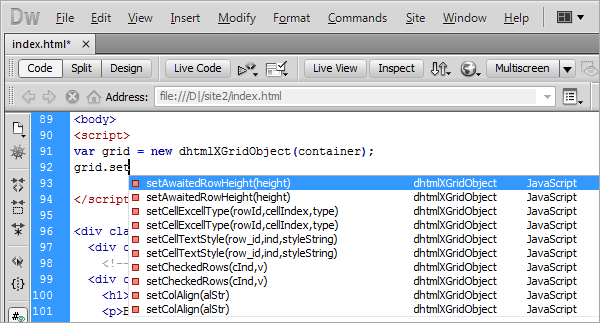 ie var grid = new dhtmlxGridObject(); the autocomplete works on grid ..
Is this to be expected ? The description files contain all details about attachGrid method but Komodo will do type-applying only on classes created with new. We will check how it can be workarounded, but unfortunately there is no simple and fast solution. Is it updated for dhtmlx 3.5 and phpstorm 5 ? The files that worked for the older version of PHPStorm will work for the new version as well. It will be very pleasant to get support for notepad ++ . Maybe you have xml file of function , which can be adopted for notepad ++ ? Currently we don’t have such a file. Maybe exist some news about autocompletes in notepad ++ ? Unfortunately, there are no any news about this feature. The priority of this task is not high so I’m afraid it won’t be added in the near future. What about vs2012? is possible to get it to vs2012 working with js files (no aspx with scripts inside) ? you also had a nice link above..
what about support for https://atom.io ? I’ve just install the webstorm update (v9) and the autocomplete doesn’t work anymore. Is there any dhtmlx3.sdoc.js update ready? Would LOVE this for Sublime Text! Will you guys look into that please? Any plans to add support for Sublime Text please? Can you please clarify what functionality do you mean under “support for Sublime Text”? Can you implement autocompletion for Sublime Text 3? Unfortunately, we don’t plan to implement autocompletion for Sublime Text 3 at the moment. If it’s crucial for your project, we can make it for you, but it’s payable. In this case, please contact me via email (support@dhtmlx.com). Is there a way in visual studio code to get the autocomplete available ?